1723/25 built als eigenes Wohnhaus erbaut. fürstliche Familie von Hutten veräussert. 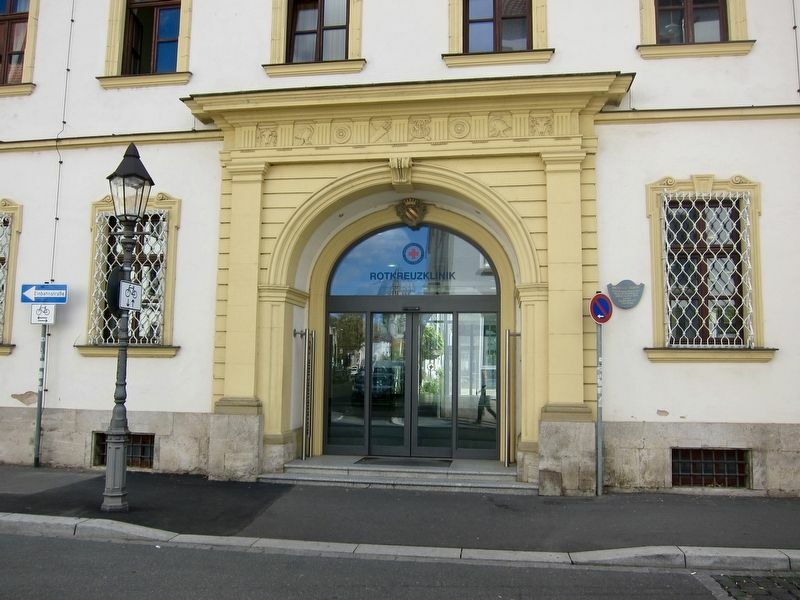 Jetzt Krankenhaus des Roten Kreuzes. Built 1723-25 as his own home. Right after completion the building was sold on to the princely von Hutten Family. Now a Red Cross hospital. Location. 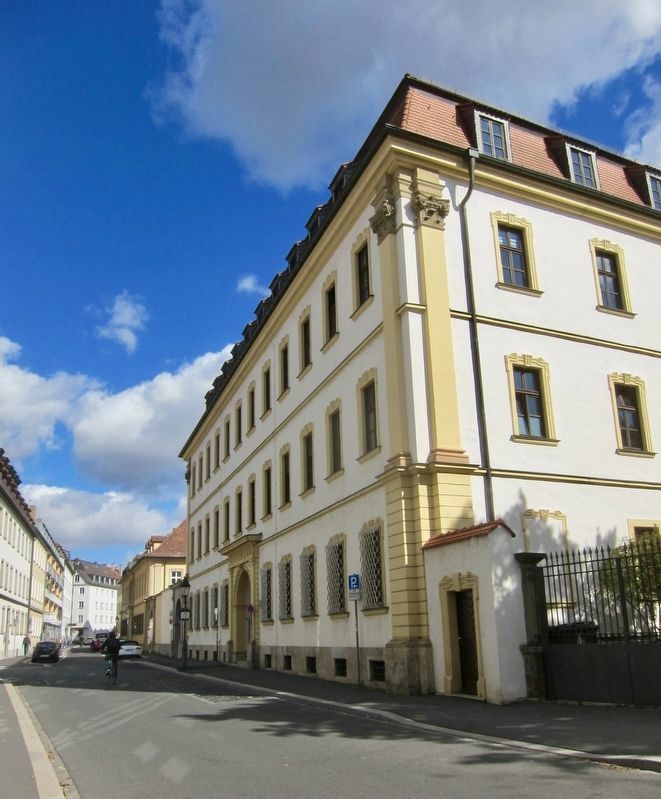 49° 47.714′ N, 9° 56.331′ E. Marker is in Würzburg, Bavaria. Marker is at the intersection of Kapuzinerstraße and Rüdigerstraße, on the left when traveling west on Kapuzinerstraße. Touch for map. Marker is at or near this postal address: Kapuzinerstraße 2, Würzburg, Bavaria 97070, Germany. Touch for directions. Other nearby markers. At least 8 other markers are within walking distance of this marker. Altersheim "Hueberspflege" / "Huebers Care" Senior Home (within shouting distance of this marker); Adolf Eugen Fick (within shouting distance of this marker); Richard Wagner (about 90 meters away, measured in a direct line); Johann Georg Oegg (about 90 meters away); Helena Petrowna Blavatsky (about 120 meters away); Hannsheinz Bauer, 1909 - 2005 (approx. 0.3 kilometers away); Julius Reichsgraf Von Soden (approx. 0.3 kilometers away); Theodor Drey (approx. 0.3 kilometers away). Touch for a list and map of all markers in Würzburg. More. 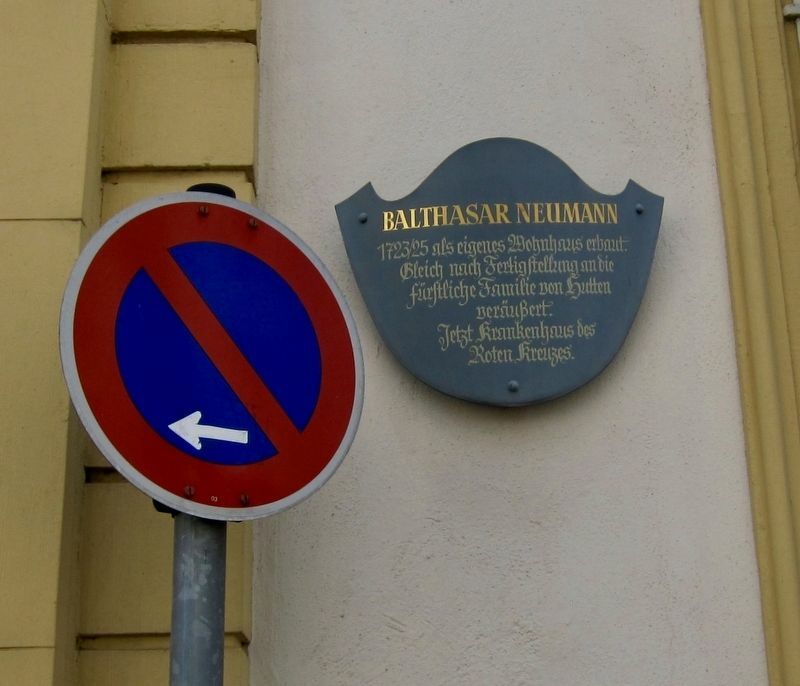 Search the internet for Balthasar Neumann. Credits. This page was last revised on February 23, 2019. This page originally submitted on February 23, 2019, by Andrew Ruppenstein of Sacramento, California. This page has been viewed 75 times since then. Photos: 1, 2, 3. submitted on February 23, 2019, by Andrew Ruppenstein of Sacramento, California.